Following the on-demand success of Topps Now Baseball, Panini joins the real-time, print-to-order business with 2016 Panini Instant Copa America Centenario Soccer. 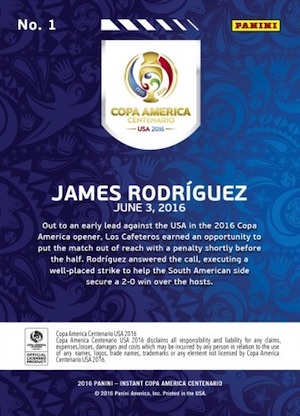 Featuring previous-day highlights of the 2016 Copa America Centenario tournament held in the United States, cards will be sold for a 24 hour period before being retired from production. Shop for 2016 Panini Instant Copa America cards on eBay. These daily 2016 Panini Instant Copa America Centenario cards will be sold exclusively through the Panini Online Store and are selected based on what happens on the pitch during the prior day. There will be a base Red border version for each card, numbered on the back to the specific print run, as well as Green (#/25), Blue (#/5) and Black (1/1) parallels. The tournament consists of 16 teams and includes regular heavyweights Argentina and Brazil as well as the United States, Mexico, Chile, Colombia and Uruguay. The event kicks off on June 3 and runs throughout the month when a champion will be crowned. Full details on the teams and schedule can be seen at the official website for the Copa America. The Panini Instant brand taps into the company's immense success with their World Cup stickers and traditional cards. 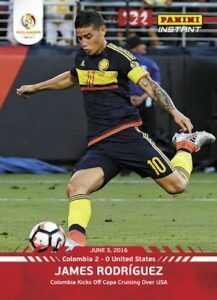 Collectors can also find a full sticker set — 2016 Panini Copa America Centenario Soccer Stickers — that offers detailed coverage of the many teams and players taking part in the 2016 Copa America. The 2016 Panini Instant Copa America Centenario checklist can be seen using the tab above and will be updated as new cards are announced. Specific card print runs will be added as they are provided by Panini. Cards will be shipped within three to five days from the end of the selling period. Panini has even added a countdown timer next to the listings so collectors know exactly how long until the cards sell out. Panini will also produce Euro 2016 cards under the Panini Instant brand. Cards and other details will be added as they are announced. Shop for available Instant Copa cards on Panini. Click on the links below to shop for previous Panini Instant Cards on eBay.